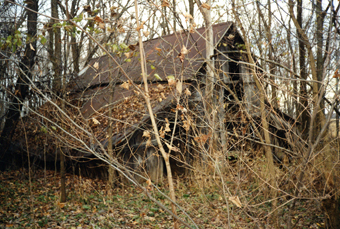 The patch of woods at the corner of Old Xenia and Roberts Mill Road, just south of London, is known locally to be haunted. For years a woman's ghost has been sighted by people driving by late at night, walking aimlessly among the trees. She is associated with a farm that used to occupy this corner, roughly 150 years ago, before new growth filled the area with trees. 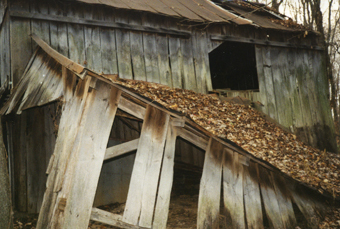 Remnants of the farm are still standing—barely––under the canopy. With floorboards so eroded they look like driftwood, there's not much left to stand on, but there's still plenty left to study and sift through. Most of the ruins seem to be barns and other storage buildings so old they're held together with long, triangular, individually-forged nails. Some still contain worthless antiques; a splintered bed frame complete with headboard, a broken chest of drawers, and a trunk with no lid occupy one loft, accessible only by climbing some of the flimsiest stairs imaginable. If the legends are true, these things once belonged to a pioneer family who moved to the old Virginia Military District in the earliest days of Ohio's statehood. They were massacred either by Indians or bandits and their farm was left to rot. Were they killed for their money, or because of a territorial dispute? No one knows. Maybe because her story is lost to the living, the mother takes her morose nocturnal walks through the woods and alongside the road, while the children are sometimes seen playing near their old house deeper in. A daytime trip to poke through the ruins revealed further oddity: an apiary, minus the bees. 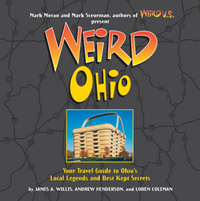 Just one more obscure chapter in the history of this weird Ohio corner.